APT, short for Advanced package Tool, is a package management system. 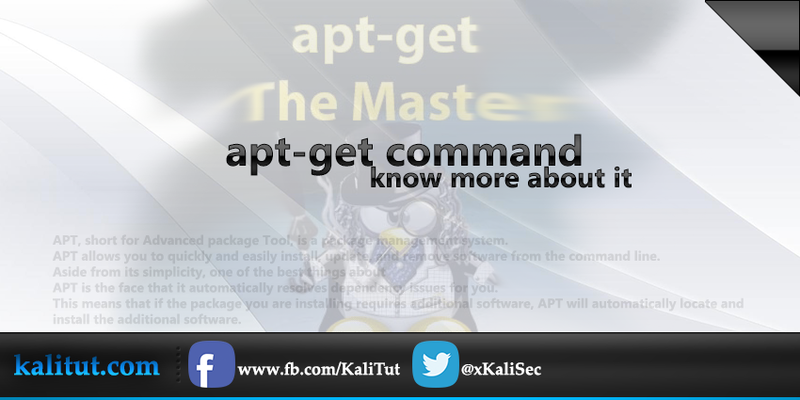 apt get allows you to quickly and easily install, update, and remove software from the command line. Aside from its simplicity, one of the best things about APT is the face that it automatically resolves dependency issues for you. This means that if the package you are installing requires additional software, apt get will automatically locate and install the additional software. This is a massive improvement over the old days of “ dependency hell” . installing software with apt get is very straightforward. For example, let us assume you want to install the classic network-mapping tool Cheops, Once you know the name of the package you want to install, from the command line you can run apt-get install followed by the name of the software you want to install. It is always a good idea to run apt-get update before installing software. This will insure that you are getting the latest version available. upgrade is used to install the newest versions of all packages currently installed on the system from the sources enumerated in /etc/apt/sources.list. dselect-upgrade is used in conjunction with the traditional Debian packaging front-end. dist-upgrade in addition to performing the function of upgrade, also intelligently handles changing dependencies with new versions of packages; apt-get has a "smart" conflict resolution system, and it will attempt to upgrade the most important packages at the expense of less important ones if necessary. So apt-get dist-upgrade command may remove some packages. The /etc/apt/sources.list file contains a list of locations from which to retrieve desired package files. See also apt_preferences(5) for a mechanism for overriding the general settings for individual packages. apt get uninstall ? there is no command like that , but the right command is apt-get remove or sudo apt-get remove if you are on a non root user. To uninstall a program, use the “ apt-get remove ” command, which is the general command for uninstalling programs on Linux. For example, the following command uninstalls nmap and deletes all the configuration files, using the “--purge” command. You can reinstall a package with apt-get install --reinstall packagename. This completely removes the package (but not the packages that depend on it) then reinstall's it. every time you install a program, the package file is downloaded and stored in that directory. where the search keyword can be all or part of a package name or any words used in its description. indicators. More q's will produce more quiet up to a maximum of 2.
or -s as APT may decided to do something you did not expect. should know what he is doing without further warnings by apt-get). meaning breaks that are of no consequence (rare). to be upgraded. Configuration Item: APT::Get::Show-Upgraded. Show full versions for upgraded and installed packages. Do not install recommended packages. harmful. It should not be used except in very special situations. Instead of fetching the files to install their URIs are printed. This option defaults to on, use --no-list-cleanup to turn it off. without prompting. Configuration Item: APT::Get::Remove. Download only the diff, dsc, or tar file of a source archive. configuration file. See apt.conf(5) for syntax information.